I have a brand new baby niece and this card is for her. It features a sweet little girlie outfit surrounded by a bevy of adorable shoes. If this baby girl is like most of the women in my family, she will love shoes. When I found the baby girl shoe paper, I knew it was just perfect for this card. The card base is 5" x 5" white Gemstones by Core-dinations. On top of that is pearlized aqua, then pink CS by Cloud 9 Design (plain side). The adorable shoe paper is by "Me & My Big Ideas". Using my Gypsy, I cut the aqua frame from Storybook at 3.8 x 3.8 cut on blackout. The inner frame (shoes) is 3.5 x 3.5. The baby's outfit is from New Arrival cut at size 2.5. The cardstock already had the look of fabric which I loved. I embossed the pieces with dotted swiss for definition and to make it truly babyish. The baby outfit is adhered to the frame using pop dots and the frame is attached to the card using thicker dimensional squares. The sentiment is puffy stickers. The little feet are cut at 1.5 from vellum then mounted onto a square of the same pink used on the front. For the lace background I used my MS punch-around-the-page punches and layered the finished piece over light aqua. I inked around the inside shoe panels as well as the baby's outfit on the front in petal pink. The verse is printed directly onto the shoe paper before splitting it in half. The right inside pink panel is 4-5/8" x 5". It used up the remainder of pink from the 12x12 piece. 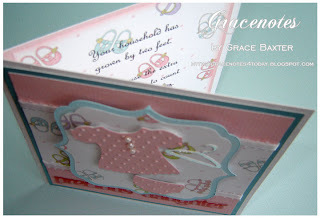 Since I always love a touch of ribbon somewhere on my cards, I trimmed the shoe background strip on the front with satin eyelet ribbon and added 3 tiny pearls to the baby's dress. The hanger is cut from shiny foil CS. The inside left panel needed a little something so I made corner pieces from the same aqua pearlized CS, punched with my MS lace punches. This card took quite awhile to complete but I love how it turned out! This is a gorgeous card!!!! Love all the detail! It comes together beautifully! 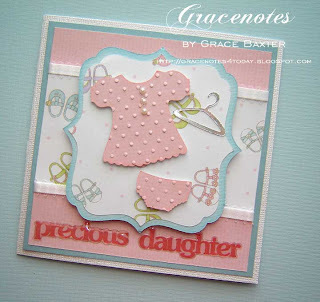 Grace, this little card is so adorable. I love that paper with the little shoes on it. Shoes have always been a favorite in my family too. I love all your details, the little outfit and the coat hanger. So precious. It is so delicate and beautiful! Just like a little lady! Such a sweet card - I am a new follower ... Thanks so much for posting and joining us at the Canadian Crafty Blog Hop … there are so many talented Crafty Canadians and I am so glad you were able to join us. this is the most adorable baby card, such sweet details...have a super week! thanks for the note invited me back to your blog! So pretty! And a wonderful job on the inside of the card too! Thanks so much for joining our "Lots of Layers" challenge this week at Shelly's Images. I love your work! I'm a new follower and I'd love for you to stop by my blog anytime! I can't wait to see what else you'll be coming up with! You are a cricut master. Makes me want to use my cricut more.